Heat oven to 325°F. 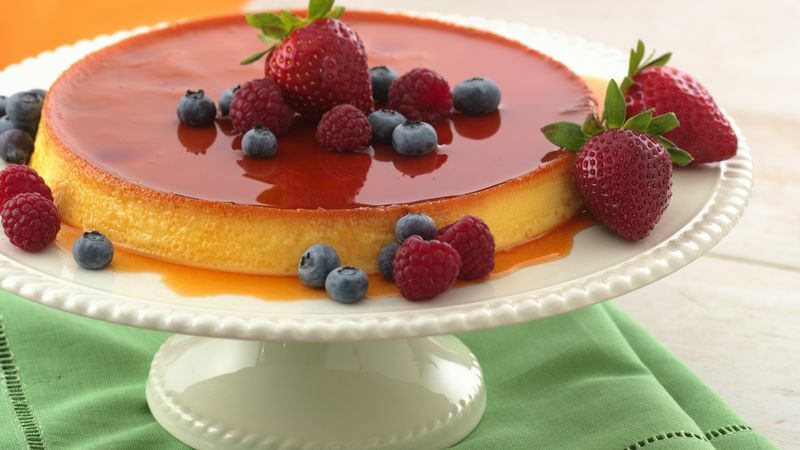 Heat 1/2 cup of the sugar in medium nonstick skillet over medium heat 7 to 10 minutes, stirring frequently with wooden spoon, until sugar is melted and a light caramel color (mixture will be very hot and could melt a plastic spoon). Immediately pour sugar mixture into round pan, 8x1 1/2 inches; tilt pan to coat bottom. Place on wire rack to cool. Mix remaining 1/2 cup sugar, milk, egg product, salt and vanilla in large bowl. Pour mixture over sugar mixture in pan. Place in rectangular pan, 13x9x2 inches. Pour very hot water into rectangular pan to within 1/2 inch of top of round pan. Bake 50 to 60 minutes or until knife inserted in center comes out clean. Remove round pan from pan of water. Cover; refrigerate until thoroughly chilled, about 3 hours or overnight. To unmold, run knife around edge of custard to loosen; invert onto serving platter. Top with fruit. This restaurant-favorite dessert is made a great low-fat way with no cholesterol. It’s also a great choice because it contains fruit, so good for your heart. Fruits and vegetables are also rich in potassium, a mineral that may help to control blood pressure and prevent irregular heart rhythms, states noted cardiologist, Dr. Roger Blumenthal, Johns Hopkins Hospital. When choosing a recipe, check the nutrition numbers so you know for sure you can enjoy it without guilt. This is a great dessert that kids like, and it's low in calories and fat.